Joey Mags used to wrestle as “Hotshot” Joey Knight teaming with Ricki Lawless in a team known as The Heavy Metal Connection..
January 30, 1991 – Clash of the Champions #14: Sid Vicious defeated Joey Maggs..
April 28, 1991 – House Show: Angel of Death defeated Joey Maggs. May 2, 1991 – House Show: One Man Gang defeated Joey Maggs. May 3, 1991 – House Show: Jack Victory defeated Joey Maggs. May 5, 1991 – House Show: Joey Maggs defeated Dr. X.
June 14, 1991 – Clash of the Champions #15: Steve Austin defeated Joey Maggs to retain the Television title..
July 20, 1991 – Worldwide: Johnny B. Badd defeated Joey Maggs. September 5, 1991 – Clash of the Champions #16: Thomas Rich defeated Joey Maggs in a dark match..
September 30, 1991 – Worldwide: Lex Luger and Mr. Hughes defeated Joey Maggs and Larry Santo. October 5, 1991 – Worldwide: The Fabulous Freebirds (Jimmy Garvin and Michael Hayes) defeated Chris Sullivan and Joey Maggs. October 27, 1991 – Halloween Havoc: Big Josh and PN News defeated The Creatures (Joey Maggs and Johnny Rich)..
February 15, 1992 – SMW TV: Rip Rogers defeated Joey Maggs. March 7, 1992 – SMW TV: Bob Holly defeated Joey Maggs. April 11, 1992 – SMW TV: Danny Davis and Joey Maggs defeated Ivan Koloff and Vladimir Koloff in the 1st round of the tag team titles tournament. May 2, 1992 – SMW TV: The Heavenly Bodies (Stan Lane and Tom Prichard) defeated Danny Davis and Joey Maggs in the semi-finals of the tag team titles tournament. May 2, 1992 – Worldwide: Scotty Flamingo defeated Joey Maggs. May 23, 1992 – SMW TV: Joey Maggs was in 18 man royal rumble match won by Buddy Landel. June 13, 1992 – SMW TV: The Heavenly Bodies (Stan Lane and Tom Prichard) defeated Ben Jordan and Joey Maggs. June 27, 1992 – Saturday Night: Steve Austin defeated Joey Maggs. August 13, 1992 – SummerSlam Spectacular: Rick Martel defeated Joey Maggs. August 29, 1992 – Superstars: Ric Flair defeated Joey Maggs. September 13, 1992 – Wrestling Challenge: Razor Ramon defeated Joey Maggs. September 26, 1992 – Saturday Night: Richard Slinger defeated Joey Maggs in a dark match. October 10, 1992 – Worldwide: The Barbarian defeated Joey Maggs. November 7, 1992 – Superstars: The Headshrinkers (Fatu and Samu) defeated Brian Costello and Joey Maggs. January 16, 1993 – Worldwide: The Wrecking Crew (Wrecking Crew Fury and Wrecking Crew Rage) defeated Joey Maggs and Johnny Rich. January 30, 1993 – Saturday Night: Chris Benoit defeated Joey Maggs. February 2, 1993 – Saturday Night: The Tazmaniac defeated Joey Maggs. March 7, 1993 – Wrestling Challenge: Doink defeated Joey Maggs. March 13, 1993 – Superstars: Lex Luger defeated Joey Maggs. March 20, 1993 – Worldwide: Maxx Payne defeated Joey Maggs. March 21, 1993 – Wrestling Challenge: Damien DeManto defeated Joey Maggs. March 26, 1993 – House Show: Marcus Alexander Bagwell defeated Joey Maggs. April 3, 1993 – Saturday Night: NWA world heavyweight champion Barry Windham defeated Joey Maggs to retain the title. April 3, 1993 – House Show: 2 Cold Scorpio defeated Joey Maggs. April 10, 1993 – Saturday Night: Paul Orndorff defeated Joey Maggs. April 11, 1993 – Wrestling Challenge: Terry Taylor defeated Joey Maggs. May 1, 1993 – Worldwide: Bobby Eaton and Chris Benoit defeated Joey Maggs and Mike Winner. July 5, 1993 – RAW: Bam Bam Bigelow defeated Joey Maggs. July 10-11, 1993 – House Show: Johnny Gunn defeated Joey Maggs. 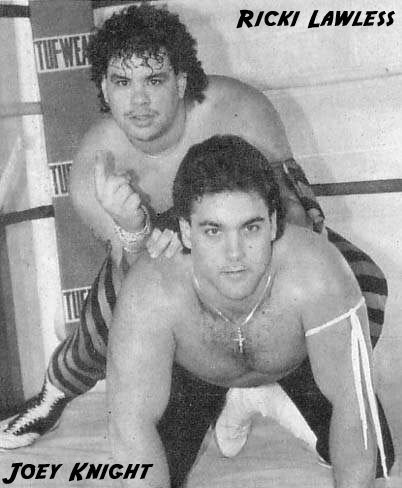 August 1, 1993 – Wrestling Challenge: The Quebecers (Jacques and Pierre) defeated Joey Maggs and Tony DiMoro. August 7, 1993 – Superstars: Doink defeated Joey Maggs. June 14, 1994 – Wrestling Challenge: Duke Droese defeated Joey Maggs. July 30, 1994 – Saturday Night: Bunkhouse Buck and Terry Funk defeated Joey Maggs and Todd Morton. August 27, 1994 – Saturday Night: Bunkhouse Buck and Terry Funk defeated Joey Maggs and Todd Morton. November 12, 1994 – Worldwide: Harlem Heat (Booker T and Stevie Ray) defeated Joey Maggs and Todd Morton. November 26, 1994 – Saturday Night: Harlem Heat (Booker T and Stevie Ray) defeated Joey Maggs and Scott Sandlin. December 3, 1994 – Worldwide: Diamond Dallas Page defeated Joey Maggs. January 7, 1995 – Worldwide: Arn Anderson and Bunkhouse Buck defeated Joey Maggs and Kenny Kendall. April 8, 1995 – Saturday Night: Meng defeated Joey Maggs. September 17, 1995 – Main Event: Disco Inferno defeated Joey Maggs. October 14, 1995 – Saturday Night: Scott Norton defeated Joey Maggs. October 21, 1995 – Saturday Night: Dean Malenko defeated Joey Maggs. October 28, 1995 – Saturday Night: Eddie Guerrero defeated Joey Maggs. November 11, 1995 – Saturday Night: Arn Anderson defeated Joey Maggs. November 16, 1995 – Main Event: Joey Maggs defeated Diamond Dallas Page by count-out. November 18, 1995 – Worldwide: Four Horsemen (Arn Anderson, Brian Pillman and Ric Flair) defeated Dave Sullivan, Joey Maggs and Mr. JL. November 26, 1995 – World War 3: Joey Maggs was in the 3 ring battle royal won by Randy Savage. December 4, 1995 – Pro: WCW United States heavyweight champion Kensuke Sasaki defeated Joey Maggs to retain the title. December 16, 1995 – Saturday Night: Joey Maggs defeated Disco Inferno. January 1, 1996 – Nitro: Joey Maggs defeated Disco Inferno in a dark match. January 27, 1996 – Saturday Night: Joey Maggs defeated VK Wallstreet by DQ. February 3, 1996 – Saturday Night: Diamond Dallas Page defeated Joey Maggs. February 10, 1996 – Saturday Night: The Four Horsemen (Arn Anderson and Brian Pillman) defeated Cobra and Joey Maggs. February 11, 1996 – Main Event: Big Bubba Rogers and VK Wallstreet defeated Joey Maggs and Sgt. Craig Pittman. February 17, 1996 – Saturday Night: Chris Benoit defeated Joey Maggs. March 2, 1996 – Saturday Night: Diamond Dallas Page defeated Joey Maggs. March 4, 1996 – Prime Wrestling: Joey Maggs defeated Maxx Muscle. March 9, 1996 – Saturday Night: VK Wallstreet defeated Joey Maggs. March 11, 1996 – WCW Monday NITRO: Diamond Dallas Page defeated Joey Maggs in a dark match. May 3, 1997 – Pro: Kevin Sullivan defeated Joey Maggs. May 26, 1997 – WCW Monday NITRO: Chris Benoit defeated Joey Maggs in a dark match. May 27, 1997 – Saturday Night: Alex Wright defeated Joey Maggs. May 31, 1997 – Saturday Night: Wrath defeated Joey Maggs. June 21, 1997 – Saturday Night: Mr. Wallstreet defeated Joey Maggs. June 24, 1997 – Saturday Night: Joey Maggs defeated Chad Fortune. July 12, 1997 – Saturday Night: Eddie Guerrero defeated Joey Maggs. August 4, 1997 – WCW Monday NITRO: The Giant defeated Joey Maggs, Lenny Lane and Scott D’Amore in a handicap match. November 16, 1997 – WCW Pro: Joey Maggs defeated Alex Porteau. January 10, 1998 – Saturday Night: Brad Armstrong defeated Joey Maggs. October 15, 2006: Joey Magliano passed away (reported to be about 37 years old)..